Cycling's Recommended Minimum Daily Allowance. Do you ride your bike enough to maintain good health ? Many sources suggest that half an hour a day of exercise is around the minimum to maintain good health. Because I work from home, I don't have a commute forced upon me, as was the case in the past. That means I don't automatically get a daily dose of cycling by going to work and back. Our deliveries are all made at least partially by bike, but while that means I'm riding a relatively heavily loaded cargo bike, the short round-trip distance of about 3 km doesn't take long enough. For that reason, I go out for a "commute" on at least some mornings even though I don't have to. This morning I rode a little over 16 km, going through the town, stopping for traffic lights, heading out into the countryside against a stiff headwind and returning home again with a tailwind which of course can never add as much as the headwind already took away. It took me 31 minutes to cover the distance. I'm not about to set any records at that speed. That's not the point. This is moderate exercise, taking it fairly easy, expending enough effort to get slightly out of breath sometimes, enough to raise a bit of a sweat but certainly not enough to make my heart pound as if is going to pop out of my chest. At a moderate rate of exertion, 30 minutes of cycling at a rate conducive to maintaining health equates to covering about 15 km at an average speed of about 30 km/h. 15 km per day equates to about 100 km per week or about 5500 km a year. i.e. it takes about 5500 km of cycling each year to do enough exercise to maintain health. If you ride a round-trip commute of around 21 km (13 miles) each day five days a week then that's just about perfect and will add up to about the annual target figure. If your commute is shorter, take a detour sometimes. People like me who don't have a regular commute to account for 5500 km (3300 miles) each year probably ought to get out on their bikes more often, which is what I do these days. An inexpensive bike computer helps keep track of the total. It's December and we're heading into winter, but that's no reason to stop: Cycling in winter is particularly rewarding. If cycling is to benefit us as exercise as well as a form of transport it should be our first choice for at the first 5000 km that we travel each year. Until we've covered that distance we can consider the cost of the "fuel" used to cycle to be zero as the alternative would be to burn away the same amount of energy by wasting it at a gym or in some other sporting activity. Motor vehicle enthusiasts occasionally make an absurd claim that the environmental cost of providing food to humans riding bicycles makes us so much less efficient than modern motor vehicles that we'd be better off driving a car than riding a bike. It's nonsense of course. Bicycles are the most efficient vehicles on the planet by some margin. This goes double for the first 5000 km because expending that energy through our bodies isn't optional. We don't need to eat extra to be able to ride those kilometres, we merely need to eat what is required to maintain a healthy weight while also taking a healthy amount of exercise. I sometimes write about health and cycling, but I am not a doctor. In particular, I am not your doctor and I certainly cannot offer health advice to you personally. If you need health advice or you're thinking about changing your exercise habits please see a professional. Update: What about the Dutch average ? What about e-bikes ? 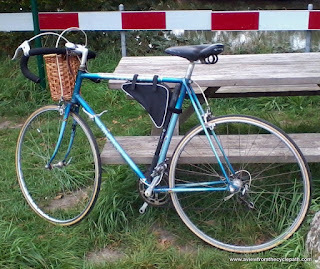 It's often quoted that the average Dutch person cycles less than 1000 km a year. If so, they're obviously not doing nearly enough exercise on their bikes to keep themselves healthy. I'm not sure I know anyone who really cycles just 1000 km a year, though. It's almost impossible to ride less than a thousand kilometres a year if you use a bike for everyday journeys. I find I often cover twice that distance on my town bike each year even though most of the distance that I cover is on other bicycles, and I don't even have a regular commute these days. Research has shown that average e-bike riders don't get much exercise at all. If you are trying to maintain your health by riding an assisted bicycle then you will possibly not get much benefit unless you turn the assistance down and also ride much more than 5000 km a year. If you ride less than that distance then you could consider turning off the motor altogether. Otherwise you can expect less of a health benefit than would result from riding a 100% human powered bike.